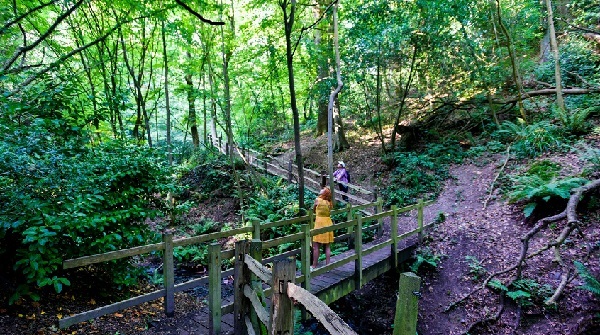 Hastings Online Times – Join the greenway walk this Saturday! There’s lots of green in Hastings if you know where to look. 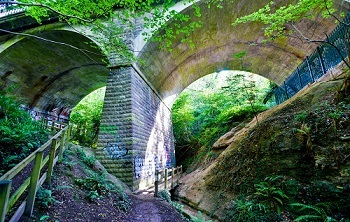 Part of the Old Roar Ghyll section of the Conquest to Alexandra Park greenway route. Join the greenway walk from the Conquest this Saturday! Now that spring has officially arrived, a new season of travelling the Hastings Greenway kicks off this Saturday. Brush the mud off your walking boots, oil your bike and join members of Hastings Greenway Group as they continue their campaign for safe, vehicle-free and environmentally friendly routes around town. Nick Terdre reports, images from Hastings Greenway Group (HGG). “We are launching the map at Saturday’s walk and we’re hoping for a good turn-out,” says HGG chairman Tony Polain. The group next aims to produce a leaflet for each walk plus a phone app. East Sussex County Council had promised to help with funding for the leaflets but then changed its mind on the grounds that if anyone got injured using one of the routes they might sue the county council, in spite of all the routes being in their Walking and Cycling Strategy and largely already public rights of way, Tony adds. The route down from the Conquest is fairly straightforward and should be fine for most people. Although the Old Roar Gill section is a bit more challenging and, Tony says, not suitable for buggies or people with disabilities. Walkers and cyclists are asked to meet at the Coffee Box cafe at King’s Church at 2pm on Saturday 30 March. HGG’s next walk will be through the Ore Valley on 28 April. HGG website and FB page.